The Louisiana Department of Health joined elected officials, community leaders, and representatives from Our Lady of the Lake on January 31, 2017 for the North Baton Rouge ER Groundbreaking. The Our Lady of the Lake North Emergency Room is expected to open in October of 2017. The facility will be staffed 24 hours a day, seven days a week by emergency physicians who specialize in providing comprehensive emergency care for patients with acute illnesses or injuries. When complete, the new ER facility will have eight treatment rooms capable of expanding up to 11 treatment spaces. It will be able to provide patients with CT scans and X-rays, and will have a full-service lab and pharmacy on-site. The ER will also include a trauma room, a bariatric room, an isolation room, an ultrasound room, an OB/GYN room and an ambulance bay. The location for the North Baton Rouge ER already includes access to primary care, oncology infusion, urgent care, and in the near future – emergency care. Patients have the opportunity to seek care in the most appropriate health care setting at the right time, and close to home. The ER is expected to treat approximately 11,000 patients per year, and the urgent care around 44,000. The State provided a one-time payment of $5.5 million to build and staff the ER as part of its public-private partnership agreement with Our Lady of the Lake. 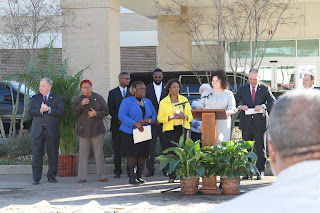 0 Response to "North Baton Rouge ER Groundbreaking"